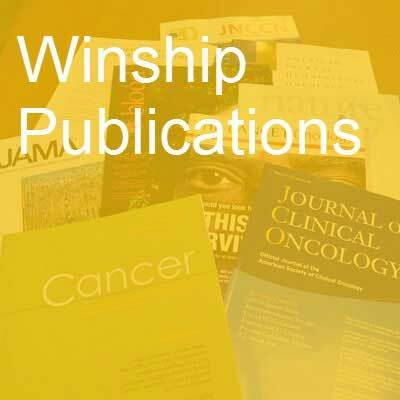 Various first authors and senior authors from Winship Cancer Institute have published 99 studies in major medical and scientific journals in the past month. Revisiting the Strait of Messina: The Balance Between Optimal Oncologic Outcomes and Complications From Surgery. Delman KA, Lowe MC. Annals of surgical oncology. 2017; 24(2):302-304. PubMed PMID: 27619941. Momelotinib in myelofibrosis: JAK1/2 inhibitor with a role in treating and understanding the anemia. Winton EF, Kota V. Future oncology (London, England). 2017; 13(5):395-407. PubMed PMID: 27785927. Epidermal Growth Factor Receptor Mutated Advanced Non-Small Cell Lung Cancer: A Changing Treatment Paradigm. Pakkala S, Ramalingam SS. Hematology/oncology clinics of North America. 2017; 31(1):83-99. PubMed PMID: 27912836. Evaluating surveillance imaging for diffuse large B-cell lymphoma and Hodgkin lymphoma. Cohen JB, Behera M, Thompson CA, Flowers CR. Blood. 2017; 129(5):561-564. PubMed PMID: 27956385; PubMed Central PMCID: PMC5290981. Younger African American Adults' Use of Religious Songs to Manage Stressful Life Events. Hamilton JB, Stewart JM, Thompson K, Alvarez C, Best NC, Amoah K, Carlton-LaNey IB. Journal of religion and health. 2017; 56(1):329-344. PubMed PMID: 27464642. Commentary on: Polyurethane Implants in 2-Stage Breast Reconstruction: 9-Year Clinical Experience. Carlson GW. Aesthetic surgery journal. 2017; 37(2):177-178. PubMed PMID: 27940907. O-002 Predicting a Complicated Course for Children Newly Diagnosed with Crohn's Disease: A Multicenter Inception Cohort Study. Kugathasan S, Denson L, Walters T, Kim MO, Marigorta U, Schirmer M, Mondal K, Liu C, Stephens M, Baldassano R, Markowitz J, Xavier R, Aronow B, Gibson G, Hyams J, Dubinsky M, . Inflammatory bowel diseases. 2017; 23 Suppl 1:S1. PubMed PMID: 28125550. Civil society's role in efforts to control women's cancers. Brawley OW, Cowal SG. Lancet (London, England). 2017; 389(10071):775-776. PubMed PMID: 27814966. Proceedings of the third international molecular pathological epidemiology (MPE) meeting. Campbell PT, Rebbeck TR, Nishihara R, Beck AH, Begg CB, Bogdanov AA, Cao Y, Coleman HG, Freeman GJ, Heng YJ, Huttenhower C, Irizarry RA, Kip NS, Michor F, Nevo D, Peters U, Phipps AI, Poole EM, Qian ZR, Quackenbush J, Robins H, Rogan PK, Slattery ML, Smith-Warner SA, Song M, VanderWeele TJ, Xia D, Zabor EC, Zhang X, Wang M, Ogino S. Cancer causes & control : CCC. 2017; 28(2):167-176. PubMed PMID: 28097472; PubMed Central PMCID: PMC5303153. Bone marrow microenvironment derived signals induce Mcl-1 dependence in multiple myeloma. Gupta VA, Matulis SM, Conage-Pough JE, Nooka AK, Kaufman JL, Lonial S, Boise LH. Blood. 2017; PubMed PMID: 28151428. Whole Slide Imaging for Analytical Anatomic Pathology and Telepathology: Practical Applications Today, Promises, and Perils. Farris AB, Cohen C, Rogers TE, Smith GH. Archives of pathology & laboratory medicine. 2017; PubMed PMID: 28157404. Letter: Survey on the Use of Nuclear Renal Imaging in the United States. Halkar RK, Taylor Jr AT. Journal of nuclear medicine technology. 2017; PubMed PMID: 28154016. GM-CSF and IL-4 Fusion Cytokine Induces B Cell-Dependent Hematopoietic Regeneration. Deng J, Li Y, Pennati A, Yuan S, Wu JH, Waller EK, Galipeau J. Molecular therapy : the journal of the American Society of Gene Therapy. 2017; 25(2):416-426. PubMed PMID: 28153092. Biomarker, Molecular, and Technologic Advances in Urologic Pathology, Oncology, and Imaging. Ellis CL, Harik LR, Cohen C, Osunkoya AO. Archives of pathology & laboratory medicine. 2017; PubMed PMID: 28157406. Opinion article on lipidomics: Inherent challenges of lipidomic analysis of sphingolipids. Merrill Jr AH, Sullards MC. Biochimica et biophysica acta. 2017; PubMed PMID: 28161582. Barcoded nanoparticles for high throughput in vivo discovery of targeted therapeutics. Dahlman JE, Kauffman KJ, Xing Y, Shaw TE, Mir FF, Dlott CC, Langer R, Anderson DG, Wang ET. Proceedings of the National Academy of Sciences of the United States of America. 2017; 114(8):2060-2065. PubMed PMID: 28167778. Antiangiogenic cancer drug drives lymphangiogenic metastasis. Thomas SN. Science translational medicine. 2017; 9(376). PubMed PMID: 28179505. Depressive symptoms and inflammation are independent risk factors of fatigue in breast cancer survivors. Xiao C, Miller AH, Felger J, Mister D, Liu T, Torres MA. Psychological medicine. 2017; :1-11. PubMed PMID: 28193310. Plasma lipoxin A4 and resolvin D1 are not associated with reduced adenoma risk in a randomized trial of aspirin to prevent colon adenomas. Fedirko V, McKeown-Eyssen G, Serhan CN, Barry EL, Sandler RS, Figueiredo JC, Ahnen DJ, Bresalier RS, Robertson DJ, Anderson CW, Baron JA. Molecular carcinogenesis. 2017; PubMed PMID: 28218420. Modification of the association between recreational physical activity and survival after breast cancer by promoter methylation in breast cancer-related genes. McCullough LE, Chen J, Cho YH, Khankari NK, Bradshaw PT, White AJ, Teitelbaum SL, Terry MB, Neugut AI, Hibshoosh H, Santella RM, Gammon MD. Breast cancer research : BCR. 2017; 19(1):19. PubMed PMID: 28222775; PubMed Central PMCID: PMC5319077. Decreasing Hospital Readmission in Ileostomy Patients: Results of Novel Pilot Program. Shaffer VO, Owi T, Kumarusamy MA, Sullivan PS, Srinivasan JK, Maithel SK, Staley CA, Sweeney JF, Esper G. Journal of the American College of Surgeons. 2017; PubMed PMID: 28232058. Update from the 4th Edition of the World Health Organization of Head and Neck Tumours: Tumours of the Oral Cavity and Mobile Tongue. Müller S. Head and neck pathology. 2017; PubMed PMID: 28247230. Hepatocyte Nuclear Factor-1β Expression in Clear Cell Renal Cell Carcinoma and Urothelial Carcinoma With Clear Cell Features: A Potential Diagnostic Pitfall. Hanley KZ, Cohen C, Osunkoya AO. Applied immunohistochemistry & molecular morphology : AIMM. 2017; 25(2):134-138. PubMed PMID: 26574638. Beyond the Psychiatric Horizon: Preparing Residents for the Twenty-First Century. Rakofsky JJ, Cotes RO, McDonald WM, Schwartz AC, Rapaport MH. Academic psychiatry : the journal of the American Association of Directors of Psychiatric Residency Training and the Association for Academic Psychiatry. 2017; 41(1):125-131. PubMed PMID: 26955812. Effects of supplemental calcium and vitamin D on the APC/β-catenin pathway in the normal colorectal mucosa of colorectal adenoma patients. Liu S, Barry EL, Baron JA, Rutherford RE, Seabrook ME, Bostick RM. Molecular carcinogenesis. 2017; 56(2):412-424. PubMed PMID: 27254743. HER3 Targeting Sensitizes HNSCC to Cetuximab by Reducing HER3 Activity and HER2/HER3 Dimerization: Evidence from Cell Line and Patient-Derived Xenograft Models. Wang D, Qian G, Zhang H, Magliocca KR, Nannapaneni S, Amin AR, Rossi M, Patel M, El-Deiry M, Wadsworth JT, Chen Z, Khuri FR, Shin DM, Saba NF, Chen ZG. Clinical cancer research : an official journal of the American Association for Cancer Research. 2017; 23(3):677-686. PubMed PMID: 27358485; PubMed Central PMCID: PMC5199640. Assessment of histological differentiation in gastric cancers using whole-volume histogram analysis of apparent diffusion coefficient maps. Zhang Y, Chen J, Liu S, Shi H, Guan W, Ji C, Guo T, Zheng H, Guan Y, Ge Y, He J, Zhou Z, Yang X, Liu T. Journal of magnetic resonance imaging : JMRI. 2017; 45(2):440-449. PubMed PMID: 27367863. Persons Who Failed to Obtain Colorectal Cancer Screening Despite Participation in an Evidence-Based Intervention. Smith SA, Alema-Mensah E, Yoo W, Ansa BE, Blumenthal DS. Journal of community health. 2017; 42(1):30-34. PubMed PMID: 27395048; PubMed Central PMCID: PMC5222885. Relief of Urinary Symptom Burden after Primary Prostate Cancer Treatment. Chang P, Regan MM, Ferrer M, Guedea F, Patil D, Wei JT, Hembroff LA, Michalski JM, Saigal CS, Litwin MS, Hamstra DA, Kaplan ID, Ciezki JP, Klein EA, Kibel AS, Sandler HM, Dunn RL, Crociani CM, Sanda MG, . The Journal of urology. 2017; 197(2):376-384. PubMed PMID: 27593476. Urologist Use of Cystoscopy for Patients Presenting With Hematuria in the United States. David SA, Patil D, Alemozaffar M, Issa MM, Master VA, Filson CP. Urology. 2017; 100:20-26. PubMed PMID: 27645524. Poorly cohesive cell (diffuse-infiltrative/signet ring cell) carcinomas of the gallbladder: clinicopathological analysis of 24 cases identified in 628 gallbladder carcinomas. Tuncel D, Roa JC, Araya JC, Bellolio E, Villaseca M, Tapia O, Jang KT, Quigley B, Saka B, Basturk O, Sarmiento J, Losada HF, Patel S, Reid MD, Memis B, Adsay V. Human pathology. 2017; 60:24-31. PubMed PMID: 27666767. Single-platelet nanomechanics measured by high-throughput cytometry. Myers DR, Qiu Y, Fay ME, Tennenbaum M, Chester D, Cuadrado J, Sakurai Y, Baek J, Tran R, Ciciliano JC, Ahn B, Mannino RG, Bunting ST, Bennett C, Briones M, Fernandez-Nieves A, Smith ML, Brown AC, Sulchek T, Lam WA. Nature materials. 2017; 16(2):230-235. PubMed PMID: 27723740; PubMed Central PMCID: PMC5266633. Non-ampullary-duodenal carcinomas: clinicopathologic analysis of 47 cases and comparison with ampullary and pancreatic adenocarcinomas. Xue Y, Vanoli A, Balci S, Reid MM, Saka B, Bagci P, Memis B, Choi H, Ohike N, Tajiri T, Muraki T, Quigley B, El-Rayes BF, Shaib W, Kooby D, Sarmiento J, Maithel SK, Knight JH, Goodman M, Krasinskas AM, Adsay V. Modern pathology : an official journal of the United States and Canadian Academy of Pathology, Inc. 2017; 30(2):255-266. PubMed PMID: 27739441. Association of Optimal Time Interval to Re-resection for Incidental Gallbladder Cancer With Overall Survival: A Multi-Institution Analysis From the US Extrahepatic Biliary Malignancy Consortium. Ethun CG, Postlewait LM, Le N, Pawlik TM, Buettner S, Poultsides G, Tran T, Idrees K, Isom CA, Fields RC, Jin LX, Weber SM, Salem A, Martin RC, Scoggins C, Shen P, Mogal HD, Schmidt C, Beal E, Hatzaras I, Shenoy R, Kooby DA, Maithel SK. JAMA surgery. 2017; 152(2):143-149. PubMed PMID: 27784058. Validation of prostate-specific antigen laboratory values recorded in Surveillance, Epidemiology, and End Results registries. , Adamo MP, Boten JA, Coyle LM, Cronin KA, Lam CJ, Negoita S, Penberthy L, Stevens JL, Ward KC. Cancer. 2017; 123(4):697-703. PubMed PMID: 27783399; PubMed Central PMCID: PMC5293616. Safety of proteasome inhibitors for treatment of multiple myeloma. Schlafer D, Shah KS, Panjic EH, Lonial S. Expert opinion on drug safety. 2017; 16(2):167-183. PubMed PMID: 27841029. Screening for depression in cancer patients receiving radiotherapy: Feasibility and identification of effective tools in the NRG Oncology RTOG 0841 trial. Wagner LI, Pugh SL, Small Jr W, Kirshner J, Sidhu K, Bury MJ, DeNittis AS, Alpert TE, Tran B, Bloom BF, Mai J, Yeh A, Sarma K, Becker M, James J, Bruner DW. Cancer. 2017; 123(3):485-493. PubMed PMID: 27861753; PubMed Central PMCID: PMC5258778. Dual Inhibition of MEK and PI3K/Akt Rescues Cancer Cachexia through both Tumor-Extrinsic and -Intrinsic Activities. Talbert EE, Yang J, Mace TA, Farren MR, Farris AB, Young GS, Elnaggar O, Che Z, Timmers CD, Rajasekera P, Maskarinec JM, Bloomston M, Bekaii-Saab T, Guttridge DC, Lesinski GB. Molecular cancer therapeutics. 2017; 16(2):344-356. PubMed PMID: 27811010; PubMed Central PMCID: PMC5292063. Pancreatic Insufficiency Secondary to Tobacco Exposure: A Controlled Cross-Sectional Evaluation. Raphael KL, Chawla S, Kim S, Keith CG, Propp DR, Chen ZN, Woods KE, Keilin SA, Cai Q, Willingham FF. Pancreas. 2017; 46(2):237-243. PubMed PMID: 27846134. African American Race Is a Newly Identified Risk Factor for Postengraftment Blood Stream Infections in Pediatric Allogeneic Blood and Marrow Transplantation. Sano H, Hilinski JA, Applegate K, Chiang KY, Haight A, Qayed M, Horan J. Biology of blood and marrow transplantation : journal of the American Society for Blood and Marrow Transplantation. 2017; 23(2):357-360. PubMed PMID: 27840208. Nonclassic Inflammatory Bowel Disease in Young Infants: Immune Dysregulation, Polyendocrinopathy, Enteropathy, X-Linked Syndrome, and Other Disorders. Chandrakasan S, Venkateswaran S, Kugathasan S. Pediatric clinics of North America. 2017; 64(1):139-160. PubMed PMID: 27894441. The effect of chronic kidney disease on T cell alloimmunity. Winterberg PD, Ford ML. Current opinion in organ transplantation. 2017; 22(1):22-28. PubMed PMID: 27926546. Calcifying nested stromal-epithelial tumor (CNSET) of the liver in Beckwith-Wiedemann syndrome. Khoshnam N, Robinson H, Clay MR, Schaffer LR, Gillespie SE, Shehata BM. European journal of medical genetics. 2017; 60(2):136-139. PubMed PMID: 27965001. Flow cytometric data analysis of circulating progenitor cell stability. Mahar EA, Mou L, Hayek SS, Quyyumi AA, Waller EK. Data in brief. 2017; 10:346-348. PubMed PMID: 28004026; PubMed Central PMCID: PMC5157704. Wilms' tumor of the ovary. Alexander VM, Meisel J, O'Brien S, Khanna N. Gynecologic oncology reports. 2017; 19:18-21. PubMed PMID: 28018955; PubMed Central PMCID: PMC5176123. Improving sensitivity and specificity of capturing and detecting targeted cancer cells with anti-biofouling polymer coated magnetic iron oxide nanoparticles. Lin R, Li Y, MacDonald T, Wu H, Provenzale J, Peng X, Huang J, Wang L, Wang AY, Yang J, Mao H. Colloids and surfaces. B, Biointerfaces. 2017; 150:261-270. PubMed PMID: 28029547; PubMed Central PMCID: PMC5253252. Reconfigurable Three-Dimensional Gold Nanorod Plasmonic Nanostructures Organized on DNA Origami Tripod. Zhan P, Dutta PK, Wang P, Song G, Dai M, Zhao SX, Wang ZG, Yin P, Zhang W, Ding B, Ke Y. ACS nano. 2017; 11(2):1172-1179. PubMed PMID: 28056172. Prevention of Dietary-Fat-Fueled Ketogenesis Attenuates BRAF V600E Tumor Growth. Xia S, Lin R, Jin L, Zhao L, Kang HB, Pan Y, Liu S, Qian G, Qian Z, Konstantakou E, Zhang B, Dong JT, Chung YR, Abdel-Wahab O, Merghoub T, Zhou L, Kudchadkar RR, Lawson DH, Khoury HJ, Khuri FR, Boise LH, Lonial S, Lee BH, Pollack BP, Arbiser JL, Fan J, Lei QY, Chen J. Cell metabolism. 2017; 25(2):358-373. PubMed PMID: 28089569; PubMed Central PMCID: PMC5299059. Midesophageal Pulsion Diverticulum Resulting From Hypercontractile (Jackhammer) Esophagus. Khullar OV, Shroff SR, Sakaria SS, Force SD. The Annals of thoracic surgery. 2017; 103(2):e127-e129. PubMed PMID: 28109370. Click and Fluoresce: A Bioorthogonally Activated Smart Probe for Wash-Free Fluorescent Labeling of Biomolecules. Ji X, Ji K, Chittavong V, Aghoghovbia RE, Zhu M, Wang B. The Journal of organic chemistry. 2017; 82(3):1471-1476. PubMed PMID: 28067514. Family Strategies to Support Siblings of Pediatric Hematopoietic Stem Cell Transplant Patients. White TE, Hendershot KA, Dixon MD, Pelletier W, Haight A, Stegenga K, Alderfer MA, Cox L, Switchenko JM, Hinds P, Pentz RD. Pediatrics. 2017; 139(2). PubMed PMID: 28119426. The role of adjuvant radiotherapy in pathologically lymph node-positive prostate cancer. Jegadeesh N, Liu Y, Zhang C, Zhong J, Cassidy RJ, Gillespie T, Kucuk O, Rossi P, Master VA, Alemozaffar M, Jani AB. Cancer. 2017; 123(3):512-520. PubMed PMID: 27859018. Predicting individual brain functional connectivity using a Bayesian hierarchical model. Dai T, Guo Y, . NeuroImage. 2017; 147:772-787. PubMed PMID: 27915121; PubMed Central PMCID: PMC5303638. A supervoxel-based segmentation method for prostate MR images. Tian Z, Liu L, Zhang Z, Xue J, Fei B. Medical physics. 2017; 44(2):558-569. PubMed PMID: 27991675. Intranasal oxytocin reduces social perception in women: Neural activation and individual variation. Hecht EE, Robins DL, Gautam P, King TZ. NeuroImage. 2017; 147:314-329. PubMed PMID: 27989775.
miR-21-mediated Radioresistance Occurs via Promoting Repair of DNA Double Strand Breaks. Hu B, Wang X, Hu S, Ying X, Wang P, Zhang X, Wang J, Wang H, Wang Y. The Journal of biological chemistry. 2017; 292(8):3531-3540. PubMed PMID: 28096467. Click and Release: SO2 Prodrugs with Tunable Release Rates. Ji X, El-Labbad EM, Ji K, Lasheen DS, Serya RA, Abouzid KA, Wang B. Organic letters. 2017; 19(4):818-821. PubMed PMID: 28133965. DYRK1A regulates Hap1-Dcaf7/WDR68 binding with implication for delayed growth in Down syndrome. Xiang J, Yang S, Xin N, Gaertig MA, Reeves RH, Li S, Li XJ. Proceedings of the National Academy of Sciences of the United States of America. 2017; 114(7):E1224-E1233. PubMed PMID: 28137862; PubMed Central PMCID: PMC5321030. Overcoming therapeutic resistance in glioblastoma: the way forward. Osuka S, Van Meir EG. The Journal of clinical investigation. 2017; 127(2):415-426. PubMed PMID: 28145904; PubMed Central PMCID: PMC5272196. The exportin-1 inhibitor selinexor exerts superior anti-tumor activity when combined with T cell checkpoint inhibitors. Farren MR, Hennessey RC, Shakya R, Elnaggar O, Young G, Kendra K, Landesman Y, Elloul S, Crochiere M, Klebanov B, Kashyap T, Burd CE, Lesinski GB. Molecular cancer therapeutics. 2017; PubMed PMID: 28148715. The Impact of New Technologic and Molecular Advances in the Daily Practice of Gastrointestinal and Hepatobiliary Pathology. Xue Y, Farris AB, Quigley B, Krasinskas A. Archives of pathology & laboratory medicine. 2017; PubMed PMID: 28157407. Promoting Cas9 degradation reduces mosaic mutations in non-human primate embryos. Tu Z, Yang W, Yan S, Yin A, Gao J, Liu X, Zheng Y, Zheng J, Li Z, Yang S, Li S, Guo X, Li XJ. Scientific reports. 2017; 7:42081. PubMed PMID: 28155910; PubMed Central PMCID: PMC5290468. Methyl-dependent and spatial-specific DNA recognition by the orthologous transcription factors human AP-1 and Epstein-Barr virus Zta. Hong S, Wang D, Horton JR, Zhang X, Speck SH, Blumenthal RM, Cheng X. Nucleic acids research. 2017; PubMed PMID: 28158710. Re: "Cost-Savings Analysis of Renal Scintigraphy, Stratified by Renal Function Thresholds: Mercaptoacetyltriglycine Versus Diethylene Triamine Penta-Acetic Acid". Taylor AT, Schuster DM. Journal of the American College of Radiology : JACR. 2017; 14(2):146. PubMed PMID: 28161021. Metal-Free C-H Functionalization of Alkanes by Aryldiazoacetates. Tortoreto C, Rackl D, Davies HM. Organic letters. 2017; 19(4):770-773. PubMed PMID: 28169549. Aurora kinase A interacts with H-Ras and potentiates Ras-MAPK signaling. Umstead M, Xiong J, Qi Q, Du Y, Fu H. Oncotarget. 2017; PubMed PMID: 28177880. The American Cancer Society's Cancer Prevention Study 3 (CPS-3): Recruitment, study design, and baseline characteristics. Patel AV, Jacobs EJ, Dudas DM, Briggs PJ, Lichtman CJ, Bain EB, Stevens VL, McCullough ML, Teras LR, Campbell PT, Gaudet MM, Kirkland EG, Rittase MH, Joiner N, Diver WR, Hildebrand JS, Yaw NC, Gapstur SM. Cancer. 2017; PubMed PMID: 28171707. Cutting Edge: Chromatin Accessibility Programs CD8 T Cell Memory. Scharer CD, Bally AP, Gandham B, Boss JM. Journal of immunology (Baltimore, Md. : 1950). 2017; PubMed PMID: 28179496. Paleolithic and Mediterranean Diet Pattern Scores Are Inversely Associated with All-Cause and Cause-Specific Mortality in Adults. Whalen KA, Judd S, McCullough ML, Flanders WD, Hartman TJ, Bostick RM. The Journal of nutrition. 2017; PubMed PMID: 28179490. Virulence Inhibitors from Brazilian Peppertree Block Quorum Sensing and Abate Dermonecrosis in Skin Infection Models. Muhs A, Lyles JT, Parlet CP, Nelson K, Kavanaugh JS, Horswill AR, Quave CL. Scientific reports. 2017; 7:42275. PubMed PMID: 28186134; PubMed Central PMCID: PMC5301492. Proceedings of the first international state-of-the-art conference on minimally-invasive pancreatic resection (MIPR). Vollmer CM, Asbun HJ, Barkun J, Besselink MG, Boggi U, Conlon KC, Han HS, Hansen PD, Kendrick ML, Montagnini AL, Palanivelu C, Røsok BI, Shrikhande SV, Wakabayashi G, Zeh HJ, Kooby DA. HPB : the official journal of the International Hepato Pancreato Biliary Association. 2017; PubMed PMID: 28189345. MEMS-Based Flexible Force Sensor for Tri-Axial Catheter Contact Force Measurement. Pandya HJ, Sheng J, Desai JP. Journal of microelectromechanical systems : a joint IEEE and ASME publication on microstructures, microactuators, microsensors, and microsystems. 2017; 26(1):264-272. PubMed PMID: 28190945; PubMed Central PMCID: PMC5295839. Beliefs about genetic influences on eating behaviors: Characteristics and associations with weight management confidence. Persky S, Bouhlal S, Goldring MR, McBride CM. Eating behaviors. 2017; 26:93-98. PubMed PMID: 28199907. The OncoPPi network of cancer-focused protein-protein interactions to inform biological insights and therapeutic strategies. Li Z, Ivanov AA, Su R, Gonzalez-Pecchi V, Qi Q, Liu S, Webber P, McMillan E, Rusnak L, Pham C, Chen X, Mo X, Revennaugh B, Zhou W, Marcus A, Harati S, Chen X, Johns MA, White MA, Moreno C, Cooper LA, Du Y, Khuri FR, Fu H. Nature communications. 2017; 8:14356. PubMed PMID: 28205554; PubMed Central PMCID: PMC5316855. Development of a Meso-Scale SMA-Based Torsion Actuator for Image-Guided Procedures. Sheng J, Gandhi D, Gullapalli R, Simard JM, Desai JP. IEEE transactions on robotics : a publication of the IEEE Robotics and Automation Society. 2017; 33(1):240-248. PubMed PMID: 28210189; PubMed Central PMCID: PMC5305173. The diagnosis of pancreatic mucinous cystic neoplasm and associated adenocarcinoma in males: An eight-institution study of 349 patients over 15 years. Ethun CG, Postlewait LM, McInnis MR, Merchant N, Parikh A, Idrees K, Isom CA, Hawkins W, Fields RC, Strand M, Weber SM, Cho CS, Salem A, Martin RC, Scoggins CR, Bentrem D, Kim HJ, Carr J, Ahmad SA, Abbott DE, Wilson G, Kooby DA, Maithel SK. Journal of surgical oncology. 2017; PubMed PMID: 28211072. (99m)Tc-MAG3: Image Wisely. Taylor AT, Folks RD, Rahman AK, Polsani A, Dubovsky EV, Halkar R, Manatunga A. Radiology. 2017; :152311. PubMed PMID: 28212051. Correlates of the positive psychological byproducts of cancer: Role of family caregivers and informational support. Litzelman K, Blanch-Hartigan D, Lin CC, Han X. Palliative & supportive care. 2017; :1-11. PubMed PMID: 28219474. Phosphorylation-mediated activation of LDHA promotes cancer cell invasion and tumour metastasis. Jin L, Chun J, Pan C, Alesi GN, Li D, Magliocca KR, Kang Y, Chen ZG, Shin DM, Khuri FR, Fan J, Kang S. Oncogene. 2017; PubMed PMID: 28218905. Cost-Effectiveness of Immune Checkpoint Inhibition in BRAF Wild-Type Advanced Melanoma. Kohn CG, Zeichner SB, Chen Q, Montero AJ, Goldstein DA, Flowers CR. Journal of clinical oncology : official journal of the American Society of Clinical Oncology. 2017; :JCO2016696336. PubMed PMID: 28221865. Using Metaphors to Explain Molecular Testing to Cancer Patients. Pinheiro AP, Pocock RH, D Dixon M, Shaib WL, Ramalingam SS, Pentz RD. The oncologist. 2017; PubMed PMID: 28220022. Routine port-site excision in incidentally discovered gallbladder cancer is not associated with improved survival: A multi-institution analysis from the US Extrahepatic Biliary Malignancy Consortium. Ethun CG, Postlewait LM, Le N, Pawlik TM, Poultsides G, Tran T, Idrees K, Isom CA, Fields RC, Krasnick BA, Weber SM, Salem A, Martin RC, Scoggins CR, Shen P, Mogal HD, Schmidt C, Beal E, Hatzaras I, Shenoy R, Cardona K, Maithel SK. Journal of surgical oncology. 2017; PubMed PMID: 28230242. Risk factors and surveillance for reduced bone mineral density in pediatric cancer survivors. Siegel DA, Claridy M, Mertens A, George E, Vangile K, Simoneaux SF, Meacham LR, Wasilewski-Masker K. Pediatric blood & cancer. 2017; PubMed PMID: 28233475. Decision-making processes shaping the home food environments of young adult women with and without children. Raskind IG, Woodruff RC, Ballard D, Cherry ST, Daniel S, Haardörfer R, Kegler MC. Appetite. 2017; PubMed PMID: 28235617. Cellular and molecular identity of tumor-associated macrophages in glioblastoma. Chen Z, Feng X, Herting CJ, Alvarez Garcia V, Nie K, Pong WW, Rasmussen R, Dwivedi B, Seby S, Wolf SA, Gutmann DH, Hambardzumyan D. Cancer research. 2017; PubMed PMID: 28235764. Does the frequency of molecular monitoring after tyrosine kinase inhibitor discontinuation affect outcomes of patients with chronic myeloid leukemia? Kong JH, Winton EF, Heffner LT, Chen Z, Langston AA, Hill B, Arellano M, El-Rassi F, Kim A, Jillella A, Kota VK, Bodó I, Khoury HJ. Cancer. 2017; PubMed PMID: 28241101. Toward Hydrogen Sulfide Based Therapeutics: Critical Drug Delivery and Developability Issues. Zheng Y, Yu B, De La Cruz LK, Roy Choudhury M, Anifowose A, Wang B. Medicinal research reviews. 2017; PubMed PMID: 28240384. 3D Tissue Microarray Controls: A Potential Standardization Solution. Myers CW, Bhimji-Patel S, Rees M, Imam SA, Cohen C. Applied immunohistochemistry & molecular morphology : AIMM. 2017; PubMed PMID: 28248725. The Use of Ancillary Stains in the Diagnosis of Barrett Esophagus and Barrett Esophagus-associated Dysplasia: Recommendations From the Rodger C. Haggitt Gastrointestinal Pathology Society. Srivastava A, Appelman H, Goldsmith JD, Davison JM, Hart J, Krasinskas AM. The American journal of surgical pathology. 2017; PubMed PMID: 28248814. Ultrasound-guided spectral photoacoustic imaging of hemoglobin oxygenation during development. Bayer CL, Wlodarczyk BJ, Finnell RH, Emelianov SY. Biomedical optics express. 2017; 8(2):757-763. PubMed PMID: 28270982.